Spore Spot - Magic Mushroom Panaeolus Cyanescens Jamaica Spore Print. Spore Spot - Magic Mushroom Panaeolus Cyanescens Jamaica Spore Print. Panaeolus cyanescens (Also called The Blue Meanie" and Copelandia cyanescens) is a very aggressive strain, mycelium is tomentose or fluffy and colonises rapidly. Fruits are small but prolific. This is one of the most potent mushrooms on earth with some specimen testing at 3% active alkaloids. This particular variation is from Jamaica. Panaeolus cyanescens, also known as Copelandia cyanescens, is a mushroom in the Bolbitiaceae family. Panaeolus cyanescens is a psilocybin mushroom and is similar to Panaeolus tropicalis. Cap: 1.5 – 4 cm across, dry, at first hemispheric, expanding to campanulate to convex, with an incurved margin when young. Young caps start out light brown and fade to off-white or light gray at maturity, sometimes with yellowish or brownish tones. Often developing cracks in dry weather, slightly hygrophanous, turning greenish or blue where damaged. Gills: Broadly adnate to adnexed attachment, close, starting out gray and turning black as the spores mature. Gill faces with a mottled appearance, edges white. Spores: Jet Black, 12 - 15 x 7 - 11 µm, smooth, opaque, elliptical. With a germ pore. Stipe: 7 – 12 cm long by 2 to 3 mm thick, equal to slightly enlarged at the base, pruinose, colored like the cap, staining blue where bruised. Microscopic features: Basidia 4 spored, pleurocystidia fusoid-ventricose, cheilocystidia 12 x 4 µm. Panaeolus cyanescens is a coprophilous (dung-inhabiting) species which grows in tropical and neotropical areas in both hemispheres. It has been found in Africa(including South Africa, Madagascar and Zaire), Australia, Bali, Belize, Brasil, Borneo, the Caribbean (Bermuda, Grenada, Jamaica, Trinidad), Puerto Rico, Costa Rica, India, Indonesia (including Sumatra), Sri Lanka, Thailand, Europe (including Austria, France, Great Britain, Luxembourg, Spain, Switzerland), Japan, New Zealand, Mexico, Oceania (including Fiji and Samoa), the Philippines, South America (including Bolivia, Brazil, Paraguay, Colombia, Venezuela), Tasmania, and the United States (California, Hawaii, Louisiana, Mississippi, Alabama, Florida and Texas). 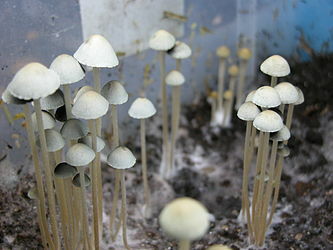 Psilocybin and psilocin containing mushrooms are illegal in South Africa. Spore prints and syringes of magic mushroom are provided for microscopy purposes only. To comply with legal regulations we cannot give advice on growing or cultivation of magic mushrooms, nor can we provide magic mushroom grow kits. Our spores and cultures are all guaranteed viable and thus it is up to the consumer to use them responsibly. We do not provide advice on growing magic mushrooms in South Africa any advice given is specific to edible and medicinal mushrooms.